If there was a contest for the best political cartoon about what’s been happening in Wisconsin, I would pick either this “fake negotiation” cartoon by Ramirez or this “coach class” cartoon by Payne. But here’s a new entry from Bok that also deserves some consideration. If you like humor about the Wisconsin fight, check out this Hitler parody about the recall. And if you enjoy humor about overpaid government employees, regardless of where they’re located, here’s a great top-10 list from Letterman and here’s a cartoon about the relationship of bureaucrats and taxpayers. Since I’m a policy wonk and not a political prognosticator, I’m not sure why people keep asking me what will happen in the November elections. But since I got lucky with my 2010 predictions, I may as well throw in my two cents. The election is now exactly five months away, so here’s my first cut at what will happen. At this point, I am predicting an Obama victory, albeit by a much narrower margin than in 2008. 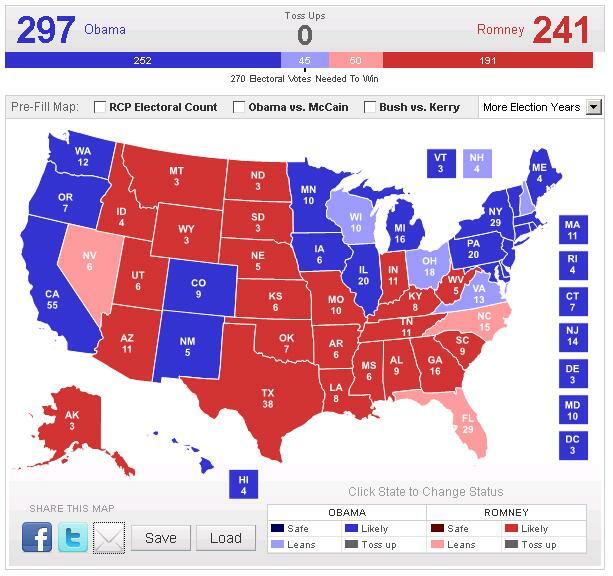 Given the weak economy and unpopularity of Obamacare, one might think Romney should be the favorite. However, the establishment media is completely in the tank for Obama and Romney is not exactly the strongest candidate, and I think those factors will tip the scales in November. That being said, Obama has dropped from being a 60 percent-plus favorite on Intrade to just a 52.3 percent favorite in recent weeks, so GOP partisans have reasons to be hopeful. Since all I care about is policy, I confess I’m not sure whether to be happy about my prediction. It all boils down to whether the “Richard Nixon Disinfectant Rule” applies to Romney. As of right now, we don’t know the answer. Here’s what I told ABC News earlier this week. “The negative spin is that he’s said all these things to basically get past a conservative-leaning Republican Party electorate and that he’s really the Massachusetts moderate that some of his opponents tried to make him out to be,” said Dan Mitchell, a Cato economist… The flip side, Mitchell said, is that if Romney does stick to his promises to conservatives, they’ll be pleased when he gives support to Paul Ryan’s budget, takes steps to lower the spending-to-GDP ratio significantly, and offers states flexibility on spending Medicaid money. We’ll have plenty of time between today and November 6 to analyze the presidential election, so let’s leave the national stage and take a look at what happened yesterday in Wisconsin and California. We’ll start with California, because there were two very important – but largely overlooked – votes in San Diego and San Jose about curtailing lavish pensions for bureaucrats. The results were shocking, particularly since California is a left-wing state. Here’s part of the AP report. Voters in two major California cities overwhelmingly approved cuts to retirement benefits for city workers in what supporters said was a mandate that may lead to similar ballot initiatives in other states and cities that are struggling with mounting pension obligations. Supporters had a simple message to voters in San Diego and San Jose: Pensions for city workers are unaffordable and more generous than many private companies offer… In San Diego, 66 percent voted in favor of Proposition B, while 34 percent were opposed. Nearly 97 percent of precincts were tallied by early Wednesday. The landslide was even bigger in San Jose, the nation’s 10th-largest city. With all precincts counted, 70 percent were in favor of Measure B and 30 percent were opposed. Yesterday’s big election, though, was in Wisconsin. Republicans took control of the state in 2010 and enacted laws to restrain the power of union bureaucracies, which led to a counterattack by the left. First, there was a recall effort against Republicans in the State Senate and that failed. Then there was a recall against one of the GOP judges on the state’s Supreme Court, and that failed. The climactic battle yesterday was to recall Governor Scott Walker. So how did that turn out? Let’s enjoy these excerpts from the Washington Post. Wisconsin Gov. Scott Walker won a vote to keep his job on Tuesday, surviving a recall effort that turned the Republican into a conservative icon…That made Walker the first governor in U.S. history to survive a recall election; two others had failed. …the night provided a huge boost for Walker — as well as Republicans in Washington and state capitals who have embraced the same energetic, austere brand of fiscal conservatism as a solution for recession and debt. In a state known for a strong progressive tradition, Walker defended his policies against the full force of the labor movement and the modern left. And he won, again. By the way, the final result in the Badger State was 53 percent-46 percent and I predicted 54 percent-46 percent, so I somewhat atoned for my awful guess on the Iowa caucuses. P.S. This cartoon accurately shows what was at stake in Wisconsin. Why Are American Tax Dollars Subsidizing a Paris-Based Bureaucracy so It Can Help the AFL-CIO Push Obama’s Class-Warfare Agenda? To be blunt, I’m not a big fan of the Organization for Economic Cooperation and Development. But my animosity isn’t because OECD bureaucrats threatened to have me arrested and thrown in a Mexican jail. Instead, I don’t like the Paris-based bureaucracy because it pushes a statist agenda of bigger government. This Center for Freedom and Prosperity study has all the gory details, revealing that OECD bureaucrats endorsed Obamacare, supported the failed stimulus, and are big advocates of a value-added tax for America. And I am very upset that the OECD gets a giant $100 million-plus subsidy every year from American taxpayers. For all intents and purposes, we’re paying for a bunch of left-wing bureaucrats so they can recommend that the United States adopt that policies that have caused so much misery in Europe. And to add insult to injury, these socialist pencil pushers receive tax-free salaries. Co-sponsoring a panel at the AFL-CIO’s offices, it should be noted, doesn’t necessarily make an organization guilty of left-wing activism and mis-use of American tax dollars. But when you look at other information on the OECD’s website, it quickly becomes apparent that the Paris-based bureaucracy has launched a new project to promote class-warfare. For instance, the OECD’s corruption-tainted Secretary-General spoke at the release of a new report on inequality and was favorable not only to higher income tax rates, but also expressed support for punitive and destructive wealth taxes. Over the last two decades, there was a move away from highly progressive income tax rates and net wealth taxes in many countries. As top earners now have a greater capacity to pay taxes than before, some governments are re-examining their tax systems to ensure that wealthier individuals contribute their fair share of the tax burden. This aim can be achieved in several different ways. They include not only the possibility of raising marginal tax rates on the rich but also…reassessing the role of taxes on all forms of property and wealth. And here’s some of what the OECD stated in its press release on income differences. The OECD underlines the need for governments to review their tax systems to ensure that wealthier individuals contribute their fair share of the tax burden. This can be achieved by raising marginal tax rates on the rich. Like Obama, the folks at the OECD like to talk about “fair share.” These passages sounds like they could have been taken from one of Obama’s hate-and-envy speeches on class warfare. But the fact that a bunch of Europeans support Obama’s efforts to Europeanize America is not a surprise. The point of this post is that the OECD shouldn’t be using American tax dollars to promote Obama’s class-warfare agenda. Here’s a video showing some of the other assaults against free markets by the OECD. This is why I’ve written that the $100 million-plus that American taxpayers send to Paris may be – on a per dollar basis – the most destructively wasteful part of the entire federal budget. One last point is that the video was produced more than one year ago, which was not only before this new class-warfare campaign, but also before the OECD began promoting a global tax organization designed to undermine national sovereignty and promote higher taxes and bigger government. In other words, the OECD is far more destructive and pernicious than you think. And remember, all this is happening thanks to your tax dollars being sent to Paris to subsidize these anti-capitalism statists. School choice doesn’t automatically mean every child will be an educational success, but evidence from other nations certainly suggests it means better overall performance. Sweden, Chile, and the Netherlands are just some of the countries that have seen good results after breaking up state-run education monopolies. The same is true in the United States. When parents have some ability to select schools, this generates competitive pressure for better results. This is true even in sub-optimal instances where the choice is merely among different government-run schools. as illustrated by the abstract of a new study from the National Bureau of Economic Research. We study the impact of a public school choice lottery in Charlotte-Mecklenburg (CMS) on postsecondary attainment. We match CMS administrative records to the National Student Clearinghouse (NSC), a nationwide database of college enrollment. Among applicants with low-quality neighborhood schools, lottery winners are more likely than lottery losers to graduate from high school, attend a four-year college, and earn a bachelor’s degree. They are twice as likely to earn a degree from an elite university. The results suggest that school choice can improve students’ longer-term life chances when they gain access to schools that are better on observed dimensions of quality. But real competition should involve private schools. Here’s the video from last year about why comprehensive school choice is good news for education. School choice is one of the few issues where I’m optimistic. If we’re beginning to make progress even in places such as California and New Orleans, we’re obviously winning. No wonder the teacher unions are sounding so shrill. Labor Day is a good opportunity to consider whether unions help or hurt ordinary workers in America. The answer is yes and no, depending on circumstances, but that’s actually the wrong question. The real issue, at least from a public policy perspective, is whether government should be a neutral referee in labor matters. The union bosses reject that approach. They want the government to tilt the playing field, which is why the Obama Administration is using the National Labor Relations Board to promote the interests of Big Labor. In this short interview on Larry Kudlow’s CNBC show, I argue that government should not have a thumb on the scale. To elaborate, here’s what I wrote last year about labor unions and the role of government. In a free society, people obviously should be free to join unions and companies should be free to negotiate with unions. But that also means that companies should be free to resist union demands and hire non-union workers. There is no right or wrong in these battles, just as there is no right or wrong when McDonald’s decides to sell french fries for a particular price. The market will reward good decisions and penalize bad choices. The only appropriate role for policy in this area is to enforce contracts and protect public safety. I then make what should be an obvious point about what happens if unions use the coercive power of government to push wages – when adjusted for productivity – above a competitive level. …above-market wages (at least in the private sector) are not sustainable in the long run. Workers ultimately get paid on the basis of what they produce and if it costs $25 per hour to employ a worker and that worker produces $23 per hour of output, that ultimately is a recipe for unemployment. A good example is the American auto industry, which has declined in part because of a compensation system that is not matched by productivity. This does not necessarily mean that wages are too high. It could mean that productivity is too low. Some of that, to be sure, is the fault of government policies such as a corporate tax system that penalizes investment (thus making it more difficult for workers to boost productivity). But unions also have used their government-granted power to insist on absurd workforce practices. The important point in that passage is that unions may be hurting workers, not with demands for unsustainable wages, but instead by imposing work rules that undermine productivity. That’s an empirical issue, to be sure. But here’s the bottom line. Government favoritism may help workers in the short run by temporarily pushing wages higher, but may hurt them in the long run by making companies – or, as I mentioned in the Kudlow interview, entire industries – uncompetitive. My Cato colleague, Mark Calabria, recently explained how the minimum wage destroys jobs, and I’ve written on several occasions why government-mandated wages can create unemployment by making it unprofitable to hire people with low work skills and/or poor work histories. And I’ve attacked Republicans for going along with these job-killing policies, and also pointed out the racist impact of such intervention. But this cartoon may be a more effective argument for getting government out of the business of interfering with market forces. It’s simple, direct, and gets the point across. I’m not sure that always happens with my writing. My former intern, Orphe Divougny, also did a very good job in explaining why politicians shouldn’t interfere with the right of workers and employers to enter into labor contracts.